The Scatchard plot of bound /free = [RH]/[H] on the ordinate versus bound [RH] on the abscissa yields a straight line, as shown in Figure 1-31. When the line is extrapolated to the abscissa, the intercept gives the value of Bmax (the total number of specific receptor-binding sites). The slope of the negative straight line is — Ka or —l/Kj. The Kd values for steroid receptors typically fall in the range of 10 ~IO-10 8 M. This very low number is a reflection of how far to the right Eq. (1) lies. This is to say, in a mixture of H and R, there is virtually no free hormone and most exists as HR. Also, the low Kd value is a testament to the three-dimensional organization of the ligand-binding domain, which very effectively interacts to "capture" the ligand. These interactions are generally marked by a high degree of specificity so that both parameters describe interactions of a high order, indicating the uniqueness of receptors and the selectivity of signal reception. These analyses are sufficient for most systems, but become more complex when there are two components in the Scatchard plot. In this case, the straight line usually bends as it approaches the abscissa, and a second phase is observed somewhat asymptotic to the abscissa while still retaining a negative slope (Figure 1-32). In order to obtain the true value of Kd for the steeper, higher affinity sites, the low-affinity curve must be subtracted from the first set, which also corrects the extrapolated value of Bmax. From these analyses, information is concluded on the Kd: the number of classes of binding sites (usually one or two) and the maximal number of high-affinity receptor sites (receptor number) in the system. The homeostatic set point of any given endocrine system is determined not only by the balance of hormone secretion in relation to the generation of the desired biological response(s) but also through regulation of the receptor performance (Kd) and receptor levels in the various target tissues. 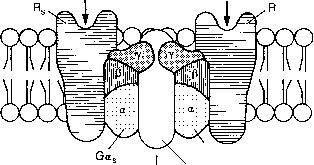 FIGURE 1-34 Schematic diagram of occupied membrane receptors interactive with G proteins and adenyl cyclase. Adenylate cyclase is responsible for the conversion of ATP to cAMP. The occupancy of Rj by stimulatory hormones stimulates adenylate cyclase via formation of an active dissociated G„ subunit. The occupancy of Ri by inhibitory hormones results in the formation of an "active" G„ complex and a concomitant reduction in cyclizing activity. The fate of /3- and y-subunits in these dissociation reactions is not yet known. 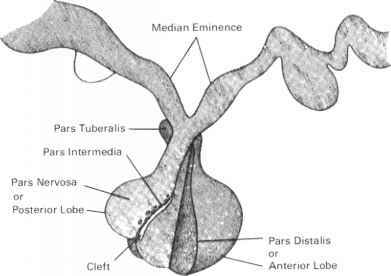 Abbreviations: G„, stimulatory hormone receptor, G„, inhibitory hormone receptor. tive cooperativity. In the absence of cooperativity, the population of the receptor's hormone-binding sites behaves identically and independently, but in the instance of cooperativity (either positive or negative), the properties of the ligand domain change as the level of receptor occupancy or receptor concentration changes (Figure 1-33A). Thus, the Kd of the receptor in question may be changed via the presence of a second allosteric binding site, which, when it is occupied, causes a conformational change in the receptor that, in turn, results in a small change in the environment of the hormone-binding domain. Potential ligands for the second allosteric binding site include Ca2+ and GTP (for those receptors that interact with G proteins) and changes in local pH; also, phosphorylation of membrane receptors is known to change the KA for hormone binding. Alternatively, the conformational change in the hormone-binding domain may be affected through the formation of receptor dimers. Here the physical contact between the two receptor molecules generates a conformational change that can alter the Kd for cognate hormone binding. The concentration of a specific receptor in a given target cell can also be regulated by the host organism. In a normal target cell, the number of receptor molecules has been found to vary from approximately 1000 to 50,000 per cell. But for any given receptor, the concentration of the functional receptor in any given cell may, under some circumstances, be increased (upregu-lation) or decreased (down-regulation) (see Figures 1-33B and 1-33C). Obviously, large changes in receptor concentration could dramatically increase or decrease the ability of that target cell to generate biological responses. A variety of mechanisms exist for changing functional receptor concentration; these include increased rate of biosynthesis (by a hormonally induced increase in gene transcription for that receptor or changes in the rate of receptor catabolism (by endocy-tosis or proteolysis). When the change in receptor concentration is effected by the cognate hormone, the process is referred to as homologous regulation, and when the change is effected by other regulatory factors the process is referred to as heterologous regulation.